If you have a collision with a large truck, and it is not your fault, the process of getting the compensation you deserve is very complicated. Retaining the services of an experienced truck accident attorney as soon as possible after your accident is the best option for navigating the complexities of a big truck accident and getting financial compensation. Proving negligence – In truck accident cases there may be multiple parties involved besides the truck driver, such as the trucking company and the truck part manufacturer. Collecting evidence also may be difficult in truck accidents since records could be insufficient or purposefully falsified. For these reasons it is imperative that you obtain as much documentation at the accident scene, if you are able. An experienced truck accident attorney will also be able to assist you in understanding the tricks that are commonly used by commercial truck insurance companies to limit or avoid paying for damage caused by their clients. Increased damages – Truck accidents often result in catastrophic and even fatal injuries. Such injuries typically require extensive, ongoing medical treatments for months or years, which can lead to significantly high medical expenses. In addition, people with catastrophic injuries may incur various other extensive losses, such as lost earnings after missing work for a substantial amount of time, current and future pain and suffering, and permanent disabilities. Understanding the complexities that go into determining the proper compensation should be left to your commercial truck attorney. The Law Offices of David Kohm has many years of experience in dealing with truck accidents and determining the proper amount of damages. Trucking insurance – It is mandatory for trucking companies to have extensive insurance policies by law. Furthermore, a company may have a separate insurance policy from the truck driver, and both parties may be legally liable. Dealing with a variety of insurance adjusters that are all attempting to limit liability can be an arduous challenge, and they will typically make settlement offers that are not able to cover all of your losses. If you would like to maximize the amount that you could receive from your commercial trucking accident, you will want to hire an experienced truck accident attorney who understands how to deal with difficult insurance companies. Finding the person at fault in a truck accident is not as straightforward as for two passenger vehicles. The trucking accident could be caused by the driver of the passenger vehicle, the truck driver or the owner of the truck or trucking company. It also needs to be ascertained if defective parts contributed to the accident, which may put the fault on manufacturers or distributors. A lawsuit can be brought against the at-fault truck driver, truck owner or company by a third party. For example, if the injured person is no longer to support his or her family, the family may sue the truck company. This could be for compensation for pain and suffering, lost wages because of medical treatments or even a lost job, and, in worst-case scenarios, it could be for wrongful death. One of the most complicated parts of commercial truck accidents is the multiple insurance companies and policies that need straightening out. 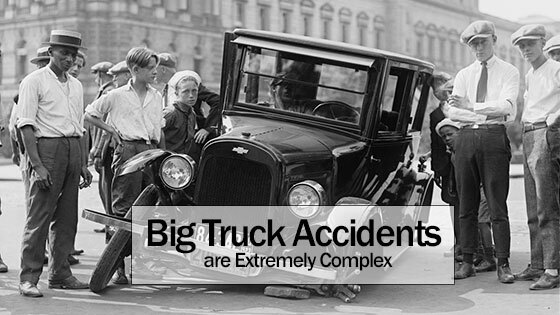 This is where an experienced truck accident attorney is essential. There is one policy that covers the truck and another that covers the driver. In addition, the trucking company may have separate policies to cover trailers and goods. These insurance policies may all be with one insurance company, but they may not. If they are from several companies, it gets even more complicated. If you have been involved in an accident with a commercial truck, don’t wait to get professional legal help. The Law Offices of David Kohm provide you a free consultation on your commercial trucking accident. Call our law offices today at any of our convenient locations and get a free consultation.